The last few leaves adorned in bright red hues cling to a tree during Autumn along the banks of the Oxtongue River in Oxtongue River-Ragged Falls Provincial Park in Ontario, Canada. As the river rushes past the Autumn colored trees, each leaf will slowly fall and lay itself to rest amongst the large rocks or journey down the river to places unknown. Many trails wind through Oxtongue River-Ragged Falls Provincial Park in Ontario, Canada where visitors can admire the colored leaves and the river rushing by. The trees in the park change at different times throughout Autumn allowing the wilderness to change slowly and giving the wildlife time to prepare for the cold season ahead. 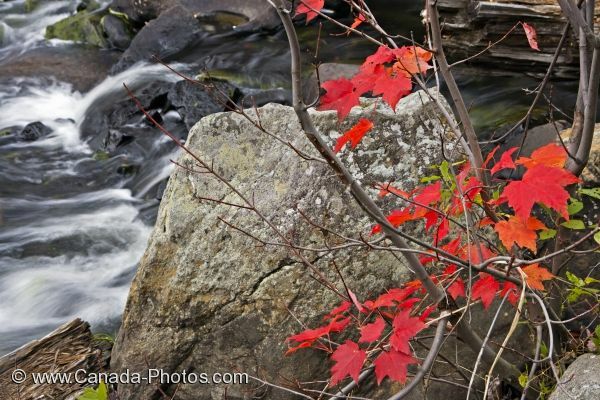 Summer is a busy time of year to explore the Oxtongue River-Ragged Falls Provincial Park but Autumn does not appear to slow down much as the colored leaves are a picture of beauty which many come to see. Picture of the Autumn colored leaves left on a tree along the banks of the Oxtongue River in Ontario, Canada. Fall scenery along the banks of the Oxtongue River in the Oxtongue River-Ragged Falls Provincial Park, Ontario, Canada.